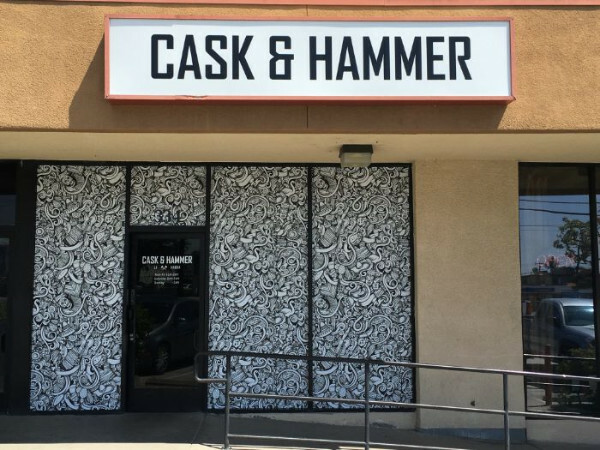 The Cask & Hammer is a dream-come-true for the craft beer lover. Located at 334 North Harbor Boulevard in La Habra, it is a sign of the times. California has discovered craft breweries and is no longer content with the usual offerings on tap. When this business opened, it experienced an immediate outpouring of support. Due to the unusual location of this business, and to keep folks coming in, the owner decided to commission window wraps that display a Mexican Day of the Dead design. Previously, the windows were painted black, and some passersby thought the bar was closed. This busy design looks great and even identifies the address with an overlay above the door. Painting windows black has always been a great way of keeping prying eyes out and enticing curious consumers to step inside for a closer look. It is also an excellent method for keeping the eyes of young folks out. Unfortunately, doing so results in a look that makes a venue look shuttered. Not surprisingly, some prospective customers may keep on driving simply because they believe the bar to be closed. The "Day of the Dead" graphics boost their brand! With a window wrap, you can still accomplish your goal of piquing the interest of thirsty patrons. It obscures the view inside even as it presents passersby with an attractive display of images that also offer your company’s color scheme or symbol choice. In the case of the Cask & Hammer, the wrap includes plenty of casks that brand with a subtle play on words. Restaurants, pubs, bars, bistros, diners, and bakeries know that windows are largely untapped assets in the day-to-day advertising of their venues. While window lettering and graphics significantly enhance name recognition and brand awareness, wraps take the marketing process a step further. Emotional appeal. Due to their smaller sizes, decals and graphics are frequently product based. Since the only limitation to a wrap is the size of your windows, you have the luxury of displaying patrons or guests enjoying your products. In this manner, you appeal to the emotions of wanting to belong, desiring to have fun, and hoping to try something different. Value information. Diners, bistros, pubs and to-go lunch spots, in particular, must compete against fast food and chain franchises. Doing so with a window wrap is possible when you display the value you offer to your guests. Pointing out happy hour specials, sack lunch pricing or free desserts turns becoming a patron you into a financially smart choice. Ethical appeal. When you specialize in locally sourced, fair trade, organic, non-GMO or similar products, advertise these goods with a wrap that shows off produce at its sources. Doing so makes your guests feel good about buying from you rather than the eatery down the street. For a pub, specifically a bar that specializes in microbrews, this offers an added value to health conscious guests. 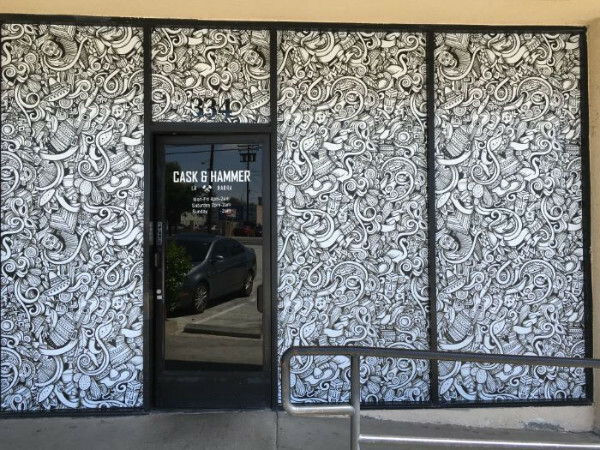 Contact our graphic artists to discuss your order of vinyl window wraps for restaurants in Orange County, CA; of course, we also treat the windows of bars, diners or any other hospitality venue.